Pro Wrestling is a game developed for the Family Computer Disk System and published in 1986. It was the seventh best selling Famicom game released in 1986, selling approximately 1,420,000 copies in its lifetime. It was later published for the NES in the United States and Europe in 1987. 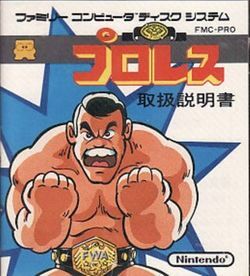 It was the first wrestling game published for the NES. The player chooses a wrestler with unique skills and presses various combinations of buttons to use different wrestling moves. It is possible to leave the ring; however, a player who does so must re-enter the ring before the referee's 20-count. Failure to do so results in a loss (via count-out) or a draw (double count-out), if both wrestlers fail to re-enter in time. This game enjoyed considerably more popularity in the United States than it did in Japan. It was ranked 172 on Nintendo Power's Top 200 Nintendo Games Ever. Nintendo never ventured into the Wrestling market again, but the game has been announced as a possible Wii Virtual Console candidate. This page was last edited on 16 November 2013, at 23:53.